The history of Ablaze Ministries starts with an organization named Collaborative Catholic Formation Ministries (CCFM). Matt Rice, with the support of family, friends, and fellow youth ministers, began CCFM in August of 2011. It was created to support those working in Catholic youth ministry while developing youth programs that sustain change and effectively catechize the youth and volunteers involved. CCFM began by facilitating the middle school formation program at St. Joseph’s Church in Bryan, Texas. By July of 2012, it had expanded to St. Mary’s Church in Caldwell, Texas, taking over both middle school & high school formation programs. CCFM also created the Ignite program to cover middle school formation, as well as the Journey program for high school formation. In 2013, CCFM launched the first Revive Youth Rally in addition to the first Enlisted event. By the end of 2016, CCFM had expanded to eight programs in four churches and one Catholic school near the Brazos Valley. In March 2016, Collaborative Catholics Formation Ministries was re-named as Ablaze Ministries to truly represent the spirit at work within the staff. Catholic youth yearn for a real relationship with Christ and to be exposed to the depth of His Catholic Church. But, youth ministers across the nation leave ministry burnt out and broken because of a lack of formation and support. Often, small parishes are unable to budget for a dynamic formation program in their church and because of this there is a fast turn-over rate in youth ministers. In today’s common model of one minister per parish, churches lose out on the many talents and experiences that could be achieved by a team of formation leaders, who could collaborate to provide a more enhanced ministry experience.While many parishes struggle to hire one YM, Ablaze makes it possible for every parish over 500 families to afford a team of trained youth ministers forging their youth for Christ. The mission of Ablaze Ministries is to implement the U.S. Bishops’ vision of comprehensive youth ministry, by engaging, nurturing, and empowering discipleship in young people, ministers and volunteers, as well as within families. All of the jobs below are considered missionary roles. 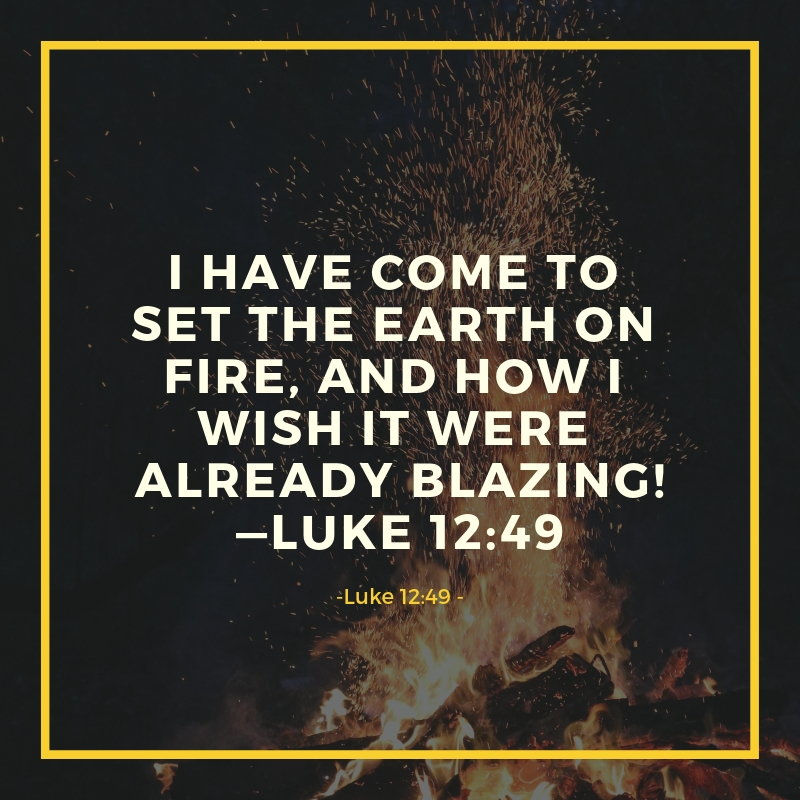 Ablaze Missionaries are individuals called to serve the Church and participate in the original mission, “to make disciples of all nations,” entrusted by our Savior to the Apostles in Matthew 28:19. Because of this radical connection to the mission of the Church, missionaries of Ablaze Ministries are dependent on raising their own salary while supporting their ministry. Support the ministers of Ablaze Ministries. Mentor missionaries and hold them accountable to their personal formation and the health of their ministry. Are supervised by a Director of Youth Ministries and their school’s Principal (or staffmember reporting to Principal). Develop and coordinate campus ministry including implementation of discipleship groups, service experiences, semester retreats, daily prayer experiences, relational ministry, and faculty formation. Serve as an extension of the youth minister and are a resource to the faculty on campus. With their ministry partner, develop and coordinate a youth ministry program, form intentional disciples, and present the faith in a way that is relevant to young people. The program creatively implements weekly youth nights, small groups, service experiences, semester retreats, prayer experiences, relational ministry, and outreach to volunteers. Serve as part time missionaries with a short-term commitment either in the summer or fall, summer or spring semester. Ablaze Ministries provides training throughout the program. Interns support outreach efforts and evangelization within their assigned ministry, growing in ministry experience to later take on a position as a youth minister or campus minister if they choose to do so. When hired, missionaries meet with the Ablaze leadership team and complete formation at the guidance of the leadership team and their Director of Youth Ministry. Ablaze Ministries’ theological formation meets the Diocese of Austin’s requirements for Catechist Level 1 Certification. Missionaries attend the St. John Bosco Conference by the Franciscan University at Steubenville as well as other professional youth ministry conferences and trainings when available. Ablaze is proud to partner with Everett Fritz and St. Andrew Missionaries to provide Ablaze missionaries with discipleship training throughout the ministry year. Everett Fritz is the founder and Executive Director of St. Andrew Missionaries. He authored the best selling book, Freedom: Battle Strategies for Conquering Temptation. Everett regularly speaks on the topics of discipleship, youth evangelization and chastity.